For one season, “misunderstood” might be the best way to describe JaMarcus Russell. It’s the lone word in the bio of his inactive Twitter account, which isn’t verified and hasn’t yielded a tweet in nearly five years. He joined the social media platform in the summer of 2010 — the same year the once-promising quarterback, who quickly emerged as a bona fide NFL bust, was released by the Oakland Raiders after just three seasons in the league. Looking back at his 31-game pro career, it’s hard to comprehend just how far, and how fast, Russell fell from NFL grace. But at the same time, it’s easy to remember how much promise he once possessed to complement his supreme physical gifts. There’s the story of him as a high school phenom from Mobile, Alabama, throwing the ball 70 yards from his knees during a recruiting visit to LSU. Fast-forward a few years and there’s his magical junior season in Baton Rouge, Louisiana, which he finished as a first-team All-SEC selection, the Manning Award winner as the nation’s top quarterback and Sugar Bowl MVP before deciding to forgo his senior year to enter the NFL. And then there’s the performance he put on display at LSU’s pro day before the draft, which left those in attendance salivating. Oakland ultimately selected the 6-foot-6, 265-pound Russell No. 1 overall in the 2007 NFL draft. It was a decision that seemed like a no-brainer to everyone except then-first-year Raiders head coach Lane Kiffin, who had his sights set on future Hall of Fame wide receiver Calvin Johnson for the top pick. Yet, at the urging of owner Al Davis, the Raiders went with the player many assumed to be their future franchise quarterback. A huge red flag, however, arose when Russell missed training camp because of a contract holdout before eventually inking the richest rookie deal in NFL history — worth as much as $68 million over six years, with $32 million guaranteed — two weeks into the 2007 regular season. Russell played in only four games, while making just one start, as a rookie. During his second year in the NFL, he started 15 games for the Raiders despite losing Kiffin, whom Davis fired a month into the 2008 regular season. Russell’s third NFL season began with him reporting to training camp weighing 305 pounds and ended with him on the bench, having won only two games in nine starts. In May 2010, the Raiders released their former No. 1 pick, ending Russell’s career in Oakland with just seven wins, 4,083 passing yards, 18 touchdowns and 23 interceptions in three seasons. He never made a Pro Bowl or played in a postseason. He never recorded more than 277 passing yards, or threw for more than two touchdowns, in a game. Two months after the Raiders released him, Russell was arrested for possessing codeine syrup without a prescription. A grand jury did not indict him based on insufficient evidence. “I could’ve went about certain things differently. I’m not sure where they went wrong. But the things that did go wrong, I take full blame for whatever was my fault, and the things that did happen. Being drafted No. 1, it’s so much they want you to do at a snap of a finger. It didn’t happen that way,” Russell said on Showtime’s Inside the NFL in 2010 while trying to make a return to the NFL with the help of former NBA player/coach turned life coach John Lucas. That summer, he worked out for multiple teams, including the Chicago Bears, but received no contract offers. By the spring of 2011, Russell’s relationship with Lucas had ended. Another comeback attempt in 2013 became the subject of an ESPN minidocumentary titled Waking Up, as well as a two-part video series by Bleacher Report, both of which chronicled Russell’s quest to get back to playing shape, after ballooning to 315 pounds, and playing form, after not throwing a football consistently for three years. Although he’d eventually get down to a reported weight of 265 pounds, no roster spots opened up for him. “You might see me back. You never know,” he said in Waking Up. “I can be the water boy and work my way into scouting team. It doesn’t matter. I’ll go play for free.” That same determined spirit inspired Russell to write letters to a collection of NFL teams in 2015, asking for a second chance. “I am willing to lead the scout team for free for one year just to get the experience in your system,” he penned to Dallas Cowboys owner Jerry Jones, according to Sports Illustrated. Russell has yet to play a down of organized football since his last game on Jan. 3, 2010, a 21-13 loss to the Baltimore Ravens, which he entered in the second half as a backup to throw one interception and lose a fumble. He’s yet to make his highly sought-after return to the NFL, and likely never will. Maybe he is, in fact, the biggest bust in NFL history. Or maybe those around him simply misunderstood the type of player he was destined to be. 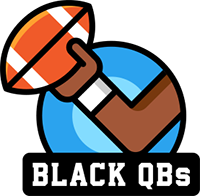 The Undefeated will profile 30 black quarterbacks leading up to the 2018 Super Bowl, which marks 30 years since Doug Williams won the big game.